Cheap electricity has helped bring industrial development to the Pacific Northwest, but utility companies fear decisions regarding the Bonneville Power Administration will increase rates. 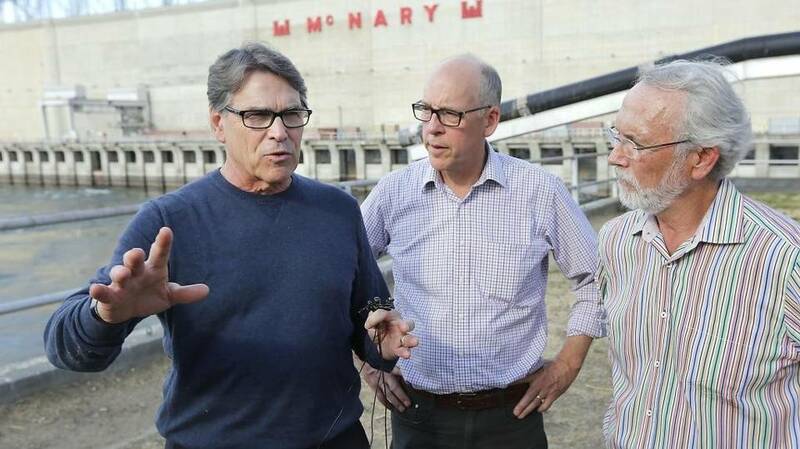 Some good news came Thursday, when Energy Secretary Rick Perry told Rep. Greg Walden that his department will not move to sell off the Bonneville Power Administration's assets without going through Congress. The idea to privatize BPA, which provides wholesale power to electric utilities across the Pacific Northwest, was proposed by the Donald Trump administration last summer. It received strong pushback from Oregon lawmakers. "It is the one idea -- bad idea -- that unites all of us in the Northwest," Walden told Perry, according to a video of Thursday's hearing before the Congressional Subcommittee on Energy in Washington, D.C. "I'm afraid this move could do nothing but harm my constituents, drive up electricity costs, and hurt consumers across the region." He asked Perry if he could assure him the Department of Energy "will leave Bonneville alone unless Congress provides explicit authorization." Rep. Kurt Schrader (D-Oregon) also spoke against privatization of the BPA during the hearing, noting that the BPA takes no appropriations from Congress, but rather operates solely on the revenue it earns from wholesale power sales. He stated that the wholesaler provides half the electricity used in the Pacific Northwest and three-fourths of the region's high-voltage transmission grid. "Selling off these transmission assets would fragment the grid, be devastating to the region and provide a meager one-time asset that would not have any long-term beneficial effects with regard to our economy," he told Perry. The fate of Bonneville Power Administration has repercussions on local utilities such as Umatilla Electric Cooperative, which gets 85 to 90 percent of its power from BPA. Steve Meyers, UEC spokesman, said in an email that customer-owned utilities in the region are concerned about the consequences of taking the system out of the hands of those who best know the system and the region's power challenges, and selling it to companies focused more on increasing profits. "Further, there is concern that the value of the BPA system would transfer from the people of the Northwest to the U.S. Treasury," he wrote. "Our ratepayers have paid to build and maintain the system, and we don't want to see it sold to fund the federal government." Even without privatization of the Bonneville Power Administration, local utilities -- and, by extension, their customers -- will likely see rate increases anyway based on a recent ruling by the Ninth U.S. Circuit Court of Appeals. The court ordered more water to be spilled from dams on the lower Columbia River and lower Snake River between April and June, with the goal of helping more fish -- particularly salmon -- pass through the dams unharmed. However, putting more water through the spillways diverts it from turbines producing electricity. In a statement earlier this month, BPA said the order created a "new multi-million dollar obligation for the region's ratepayers." The power retailer has said it will likely make up the difference by adding a "spill surcharge" to the bills of the utility companies that purchase wholesale power through BPA. Meyers said about 80 percent the power UEC provides its customers comes from hydropower. The next largest source is nuclear power, at 7.5 percent. During the March 26 city council meeting, Hermiston Energy Services superintendent Nate Rivera presented a rate comparison graph that showed the average residential power bill at HES at $116 and UEC at $118, compared to an Oregon average of $156 and national average of $208. Low power rates made possible by proximity to the dams has helped bring data centers and other heavy electricity consumers to the region. Meyers said the dams have helped with recreation, transportation and flooding along the river as well as contributing to a "multi-billion-dollar farming and food processing industry in the Hermiston-Boardman area." "UEC has been buying hydropower from BPA since 1942," he said. "UEC, and the region, owes a great deal of its prosperity to low-cost, abundant hydropower." Meyers said he didn't have a specific number yet for how much the added spill would cost UEC, but said overall estimates show that it will cost electric cooperatives collectively $7 million a year and increase carbon emissions by 840,000 metric tons a year as non-hydro sources are used more heavily. Northwest RiverPartners, an alliance of farmers, utilities and ports of which UEC is a member, has opposed the additional spill. On its website it states that already, "Literally billions of gallons of water are spilled over the dams instead of generating more carbon-free energy that could help power our economy, keep electric rates low and our skies clean, and back up less-constant energy sources, like wind and solar."